Use the search function of the GMX File Storage and keep track of your folders and files. With File Storage's search function, you can search all the folders and files in File Storage by folder or file name. This makes it easier to keep track of them. 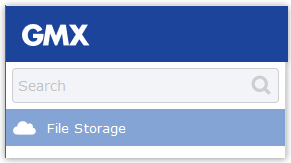 In addition to the default search function of your GMX File Storage, you can use a cross-services search by clicking the Search button in the top right corner of the navigation bar. Find more information at Cross-service search.